Billy Mayfair went to Arizona State University and won the 1986 U.S. Amateur Public Links and the 1987 U.S. Amateur Championship. Mayfair turned professional in 1988 and has won five events on the PGA Tour, including the 1995 Tour Championship. He has featured in the top 50 of the Official World Golf Rankings. 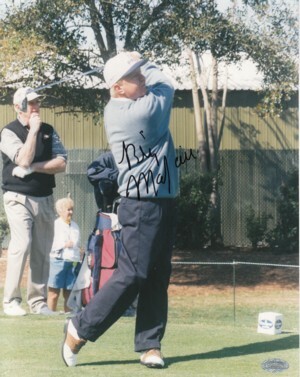 He holds the distinction of being the only player to ever beat Tiger Woods in a playoff on the PGA Tour (1998 Nissan Open) Billy Mayfair has hand autographed this 8x10 Color Photo. Mounted Memories Hologram and Certificate of Authenticity.